​Polyurethane spray foam is applied to the underside of the roof directly onto the slates, tiles or roofing felt and bonds them to each other and to the load bearing rafter timbers. Once installed this can reduce your energy bills by up to 20% and additionally significantly reduce your CO₂ footprint. 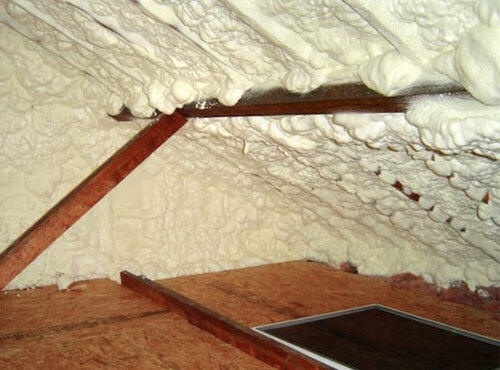 Spray foam systems give greater acoustic insulation than conventional fibreglass and other forms of insulation. At 75mm thickness, the acoustic benefit is generally accepted to be equivalent to double glazing. 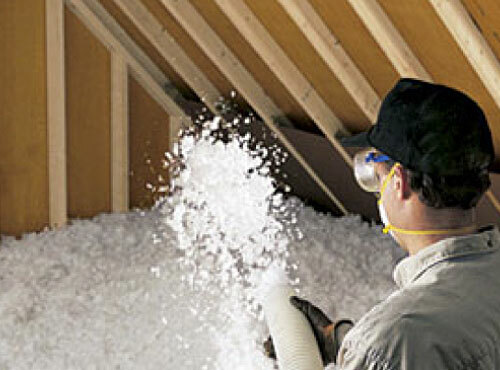 Spray foam will extend the life of your existing roof and may reduce future maintenance bills. A spray foam system guarantees a warmer property in the winter and a cooler property in summer providing greater energy efficiency and comfort. As many allergy sufferers will confirm, dust can make everyday activities unbearable. 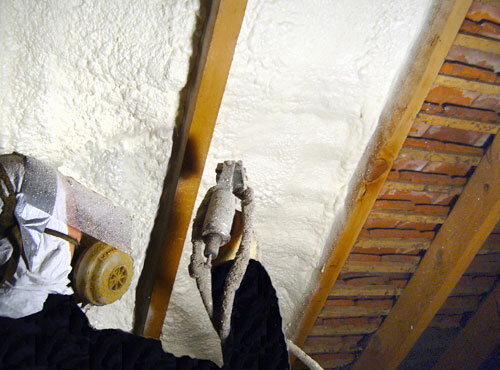 A spray foam system significantly reduces wind driven dust being blown into the loft space. A spray foam system provides a stronger more stable roof due to the high strength to low weight ratio of the foam. Spray foam systems can prevent condensation in a roof space reducing the possibility of rotting timbers, corrosion, damp and mould. A treated roof can provide an opportunity for low cost loft conversion. It can help to stabilise ageing roofs and create additional usable loft space. Spray foam is inert and does not provide any nutritional value to rodents, birds or insects, which also prevents vermin gaining access to your loft space. If you want to use your loft as a living space, you can insulate your room-in-the-roof by insulating the roof with fixed rigid insulation boards between the roof rafters. Boards must be cut to the correct width so that they fit snugly between the rafters. They can then be covered by insulated plasterboard. Similarly walls in the roof space and around dormer windows should also be insulated with rigid insulation boards. In all cases make sure there is adequate ventilation to the rafters. Greener insulation options include cork, straw and wood board. Excellent for insulating loft conversions. Can be covered with plasterboard for an attractive finish. High insulating value per unit thickness. Some boards come with their own system of attachment. 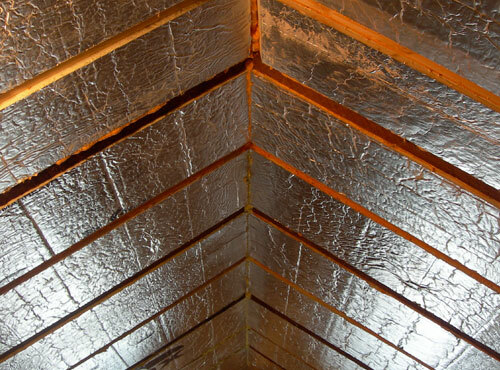 Synthetic sheet insulation materials use large amounts of energy during production. 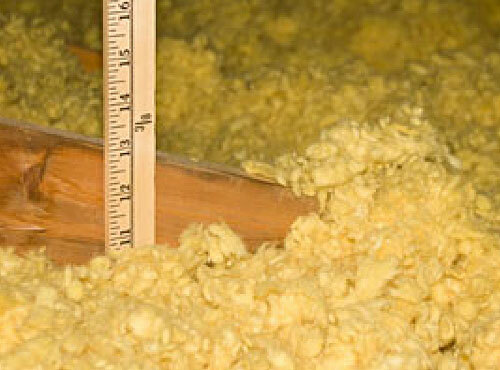 Can be more expensive than other types of loft insulation. Commercial buildings such as shops and offices. Public sector buildings such as schools and hospitals. This insulation is available as simple rolls of varying thickness and width or rolls of foil-backed felt, rock, glass or mineral fibre. 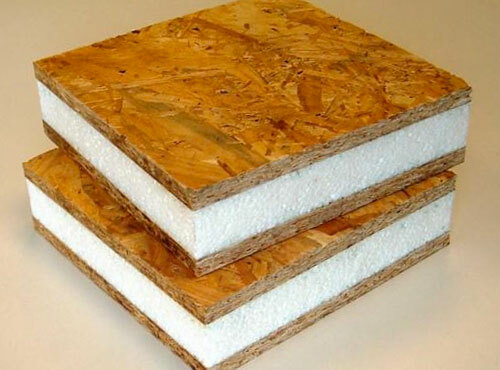 If access is easy and your loft joists are regular, you can use rolls of blanket insulation. The first layer is laid between the joists – the horizontal beams that make up the floor of the loft – then another layer is laid at right angles to cover the joists and make the insulation up to the required depth (270mm). ​ This can be done by someone competent in DIY or a professional installer. ​The most common types of insulation in the home are made primarily using glass or rock that has been melted down at temperatures well in excess of 1,000°C and spun into fine strands of wool. A binding agent is also added to help hold the strands together. These strands of wool are then formed into the rolls to fit between ceiling joists. The world’s most popular and widely used insulation material, glasswool is made from recycled glass bottles, so it is ultra-eco-friendly. 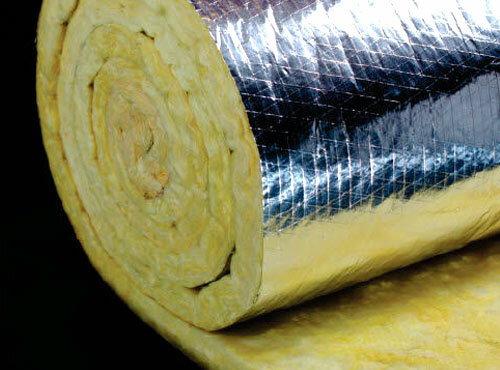 It is easy to handle and install, plus it is the most cost-effective insulation available. Rock mineral wool insulation is a more solid material than glass wool so is suitable for situations where the material may be compressed. Rock mineral wool is a very effective fire safety measure as it is resilient to heat and fire. Some brands use sheep’s wool. Sheep’s wool insulation is a fairly new insulation product, however before it is used as an insulation material, it must undergo an intensive cleaning process in order to remove the dirt and oils from the wool. The chemicals and energy used during this process must be taken into account when measuring its environmental impact. Sheep’s wool insulation can last over 50 years and is also treated against fire and insects. Good for insulating accessible spaces such as exposed wall cavities. Some materials can irritate the skin so make sure you wear proper protection. Sheep’s wool is a more expensive insulation option. Rolls of blanket insulation can be too bulky to fit in small spaces or around obstructions. 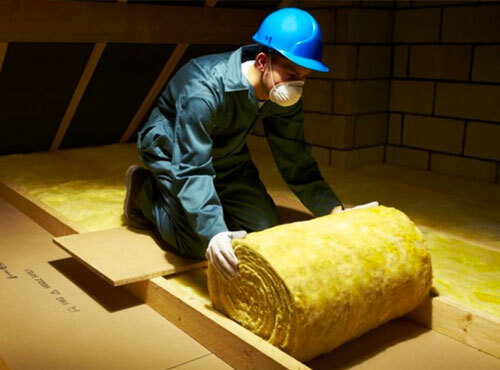 ​If your loft is hard to access, you can have blown insulation installed by a professional into the gaps between joists, they will use specialist equipment to blow loose, fire-retardant insulation material such as cellulose fibre, mineral rock wool, cork granules or even recycled newspaper into the loft. Loose-fill insulation works well in inaccessible spaces and for topping up. Fits easily between irregularly spaced joists or around obstructions. Greener insulation options include recycled paper or wool. Ideal for insulating areas where access is difficult. Useful for topping up existing insulation in attics. ​Can come loose in draughty lofts. Not recommended for insulating draughty lofts. Safety equipment and protective clothing are needed during installation. ​ Structural insulated panels are prefabricated panels that can be used in roofs. They offer excellent insulation in comparison with traditional methods. They typically consist of 10cm – 20cm thick panels that are made to fit in a factory then shipped to the site and can be made to various sizes. Structural insulated panels would ideally be used in new build properties.